Same here in Germany. 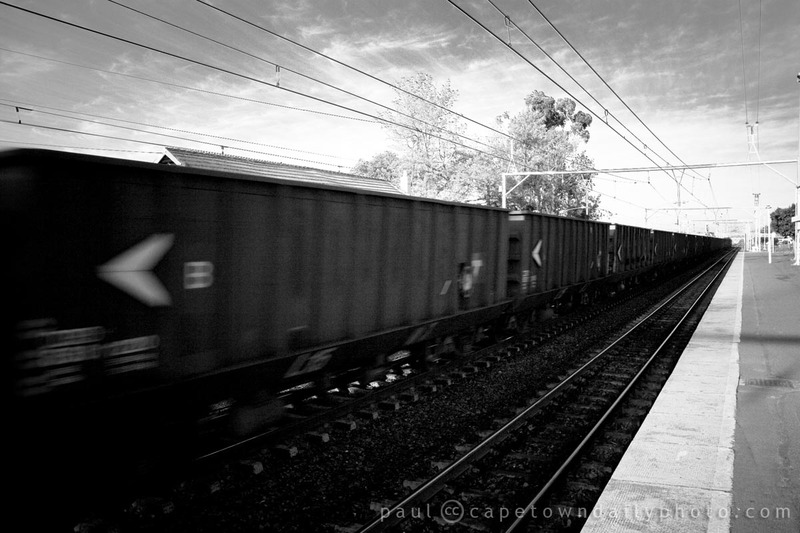 A news I found in the web says that about 17 per cent of freight were transported by train in 2007. I Think one of the big challenges is of logistic nature. In my opinion, it’s easier to drive to a company bei truck then to build a railway to that company. And what do one with the railway, if a company become bankrupt or the Deutsche Bahn (in your case the SA transport company) says that it wouldn’t have anymore the capacity to maintain this part of infrastructure? Thanks for the compliment – I had a tough time choosing between two similar photos. The other was similar, but in colour. So, yeah, I’m glad that you like this one. Wonderful picture. It evokes the emotion of looking back into the past and wondering what storm from our past will rush into our present. But the lesson is that we just have to stand still on our present platform because this too shall pass. Thanks for your interpretation Miriam – you’re right, it does evoke emotion. One could also say that it represents life’s troubles that rush past you if you stay standing on solid ground. :) The more I look at the pic, the more I like it.